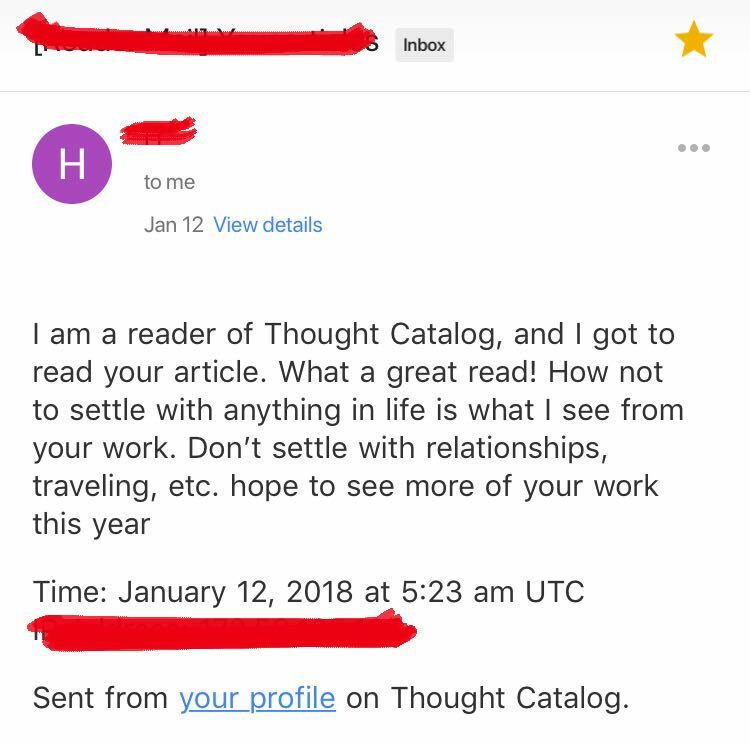 This letter was written by a reader of mine, who’s happened to stumble upon one (or two) of my articles on Thought Catalog. And so, as my token of appreciation, I’d like to share with you a beautiful letter he’s written. It is a letter of hope, love, and positivity. I hope that this year we do our best to spread love, kindness and compassion. I hope whoever you are out there, you feel that you are needed and loved in this world. That you have a duty to feel great about yourself everyday. No, I do not know what you are going through and never will, but I do understand that everyone has a journey. Everyone’s journey is different and difficult. You have been told that you have “first world problems” or “depression is all in your head”. Don’t believe what they say. You are amazing, and you deserve the stars. You should wake up every morning telling yourself how wonderfully made you are, and that this life should not be taken for granted. You woke up this morning, and your journey of life is not done yet. Which means it is another opportunity for you to be loved and give love. How special it is to be a human being in this Earth with all the possibilities at our finger tips. This year, I hope you look within yourself for love and empowerment. As men, I pray and hope that we speak up and empower women all around the world. They deserve it, and we should always support them through everything. Women have stood up for their rights for so long, and it seems as men we just keep putting them down. What kind of world is that? That’s not a world I want to live in. I want to live in a world where men and women have the same stepping stool to get where they need to. Women are amazing, and are a treasure. Because truly men, where would we be without them? Today is a new day, and yesterday is the past. Last year is the past so don’t dwell on it for too long. The future holds so much for those who want it, and I hope that you believe in yourself everyday. The transition of self-hate to self empowerment is not an easy one, but is one to be made this year. I hope this year finds you wanting more positivity in your life, more self love and self-mindset first. Put others first, but remember your worth. Remember who are as you wake up in the morning to tell yourself “this is my hour, this is my day, this is my year”. Much love to anyone and everyone who reads this. Keep supporting everyone around you, and keep loving those around you. Let 2017 be the past – 2018 will be the transition.